Existing Conditions-Two chillers are installed at one of our client site with the operating principle of vapor compression. Mostly two chillers are in running condition due to climatic condition. Cooling tower is Natural air cooling. g) Other Relevant Number Plate Refrigerant 134a, Oil Flooded, RPM of compressor 2950 RPM, Direct Drive type, step less capacity control. OUTCOME 1: Lift is difference between the evaporator pressure and condenser pressure.Greater the pressure, more energy for given load. It shows that condenser in chiller 2 condensers is fouled as it requires more energy to do the work. so it can conclude that condenser in chiller-2 is fouled. OUTCOME 3: Most chillers are designed with max condenser inlet temperature of 28°C. 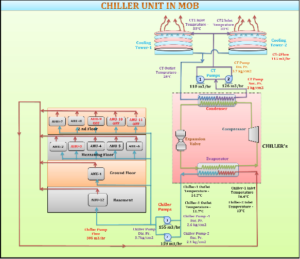 if it exceeds efficiency of chiller will decrease by 2% for every one degree in raise. OUTCOME 4: Condenser Inlet temperature for Chiller-1: 28°C and 30.5°. It can be either instrument problem or cooling tower problem. OUTCOME 5: Evaporator approach for chiller -1 & 2 is 3.22 and 4 respectively. As design data is not available auditors can’t command on it. Chiller-2 condenser need to cleaned. 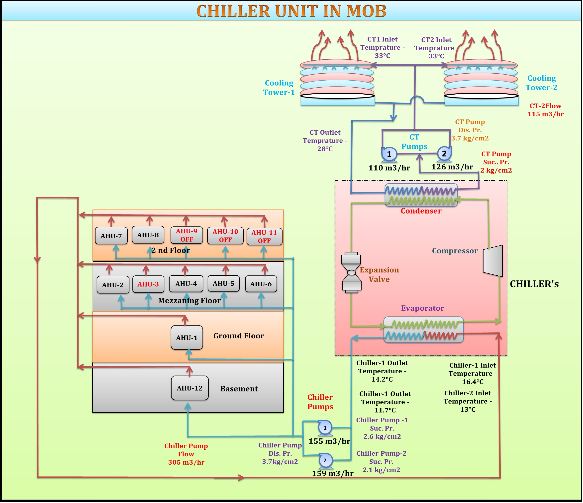 Chiller-2 efficiency will improve and approach too. This way, we helped our client in saving money by taking the corrective action through our detailed auditing for the chiller plants. Note: The above information is only for knowledge sharing and MGCS has its sole right and proprietorship of above technical data.